Enhanced Visuals: Compatible with PS4 and PS4 Pro. Enhanced with PS4™ Pro. Rapid Combat Racing: Rip around sharp bends, power through stomach-churning loops and dive down sheer drops as you take out your rivals with well-timed weapon blasts. 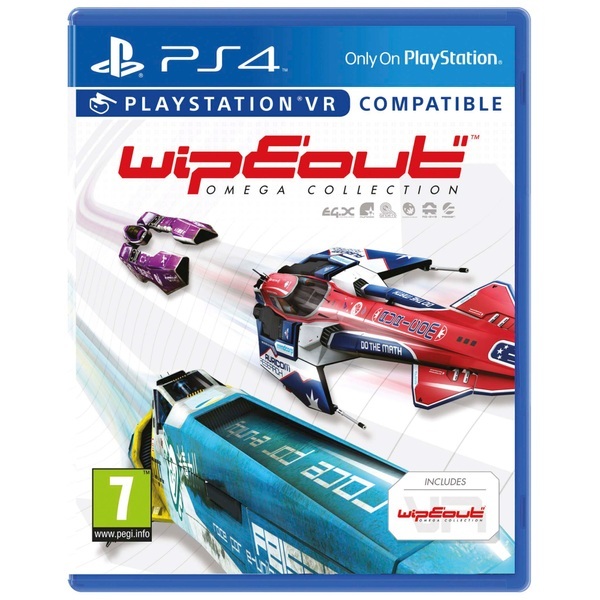 When WipEout Omega Collection hits PS4 on 7th June, you’ll be able to take your pick from the full range of classic WipEout teams: Feisar, Auricom, Mirage, Pirahana. Today, we’re really excited to unveil a brand new additional vehicle making its WipEout debut – the Tigron K- VSR. Known for its blistering speed, iconic music and pure multiplayer mayhem, WipEout has starred on every PlayStation format since 1995 – and is now set to rip through the air on PlayStation4 and PlayStation 4 Pro. VR functionality available upon installing the VR Patch update file. Sony Entertainment Network acount, high-speed internet required and 31 GB minimum HDD space required. Users must be 12 years or older.